Olympian and America’s Cup competitor, and ever-present participant on the racing circuit, Steve Colgate personifies the sport and lifestyle of sailing. For his many years of dedication to sailing education for people of all ages and walks of life, for his long history of competing and winning in the sailboat racing world – Steve Colgate was inducted into the prestigious National Sailing Hall of Fame in 2015. Steve grew up in Cold Spring Harbor, NY and started sailing Atlantic Class sailboats and Lightnings on Long Island Sound at the age of nine. 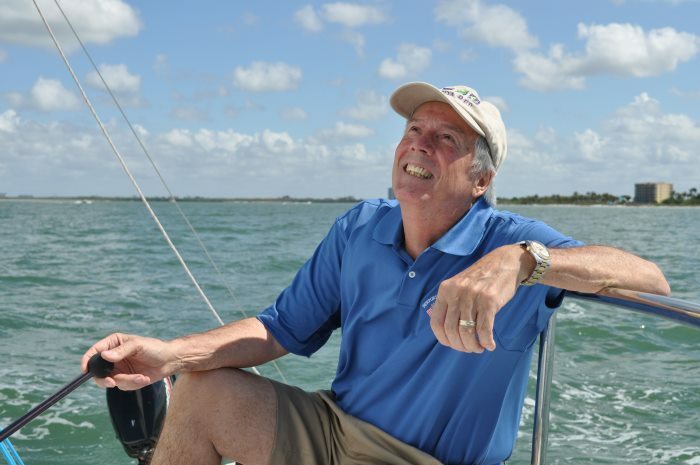 A 1957 Yale graduate, he served two years as an Air Force officer and then sharpened his knowledge of all things maritime during a four-year stint at a boat supply store in New York City, before launching Offshore in 1964. Steve’s racing career spans six decades and includes nearly every significant race in the world. In 1955 he crewed aboard the Spanish yacht Mare Nostrum in the 1955 Trans-Atlantic Race from Cuba to Spain, and they won. 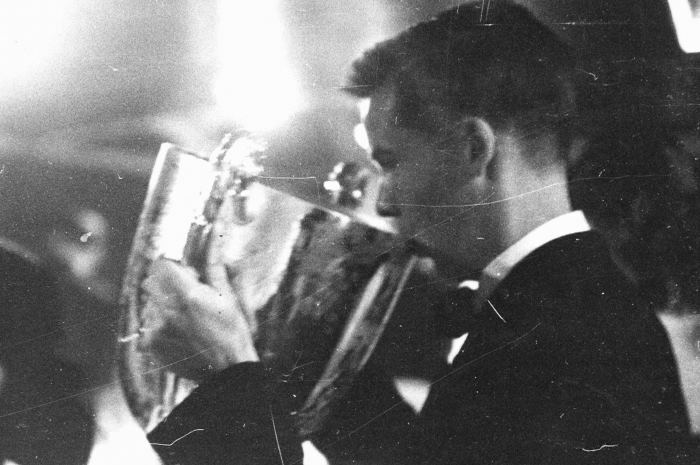 The photo at right shows Steve sharing winning accolades with champagne from the 1st place trophy. He was just 19 in that race and considers it one of the great highlights of his life. 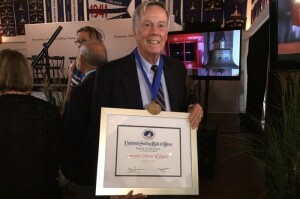 National Sailing Hall of Fame in October 2015. To date less than 100 of the most notable sailors in the United States have been inducted into this prestigious organization. crew member as he advanced through the ranks. Here he is hiking out in the Olympic Trials off Newport Beach, CA with crew-mate Stuart Walker behind him. Though they didn’t win, “being part of a 13 member team was an incredible honor,” he says. 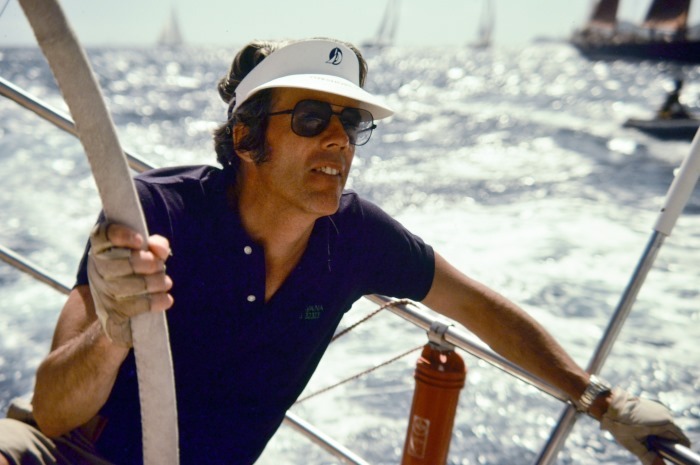 Steve competed in the 1967 America’s Cup Trials on American Eagle as foredeck chief, and the 1970 America’s Cup Trials on Heritage as tactician and occasionally helmsman. 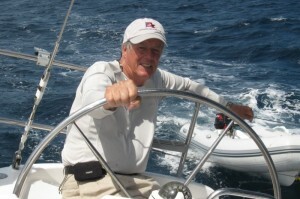 Here’s Steve steering Heritage after a long day of racing on the way back into Newport Harbor. In those days, “the window for training on 12 Metres was during the summer prior to the finals; and we were mostly all amateurs, not paid professionals,” explains Steve. Today America’s Cup campaigns start right after the last one ends, with paid crew practicing and racing full time. Although Steve crewed in numerous class championships on one-design boats like 5.5 Metres and Solings, he absolutely loves competing in long distance races on big yachts, including six TransAtlantic Races. During the the 1963 TransAtlantic Race aboard the 58’ yacht, Dyna, they lost their rudder 1000 miles from the finish and managed to come in fourth! 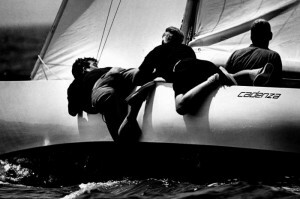 He has also competed in 20 Newport to Bermuda Races on many winning ocean racers, two of which broke the record for finishing first. 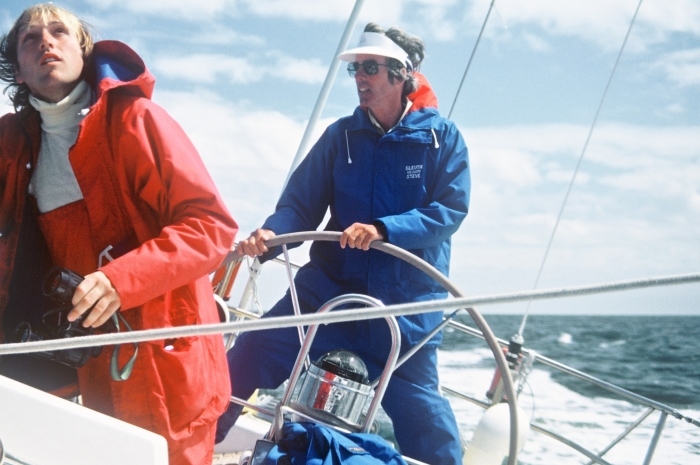 On the 81’ maxi, Nirvana, Steve was principal helmsman, steering that magnificent yacht to first place class finishes in competitions across the globe. One of the early campaigns aboard Nirvana took the Colgates to Norway where post-race festivities included inviting King Olaf aboard with his entourage. Highlights of his time on Nirvana came during the Sydney-Hobart Race in gale-force winds, and sailing up the Pearl River from Hong Kong to Guangzhou, China in 1982. 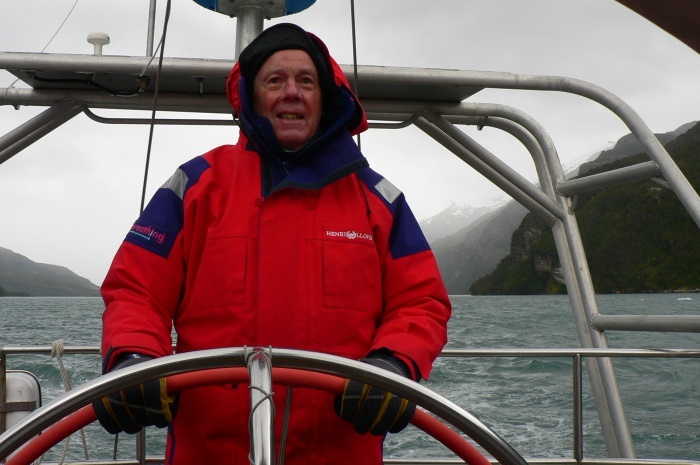 Never one to say no to a sailing invitation, in January 2007 Steve joined SAIL magazine’s editor-in-chief to sail up the Beagle Channel and around Cape Horn on the skippered yacht Seal. “Each time I take the helm, no matter where I am, my body and soul relax into the rhythm of the sea,” says Steve. Academy, United Kingdom Sailing Academy and Eckerd College as well as other service institutions and sailing schools. It is also popular among sailing club racers and day sailors. The Colgate 26 is “for sale.” If you are interested in test sailing a Colgate 26 with thoughts about purchasing one new or used, Steve Colgate is your soft-spoken, friendly “salesman.” Give him a call at 239-985-7505 or 239-218-0471 (his cell). Steve holds the Royal Yachting Association’s Yachtmaster Offshore Instructor Certificate and a U.S. Coast Guard license. He is listed in Who’s Who in America, Who’s Who in the East, and Who’s Who in the World. To talk to Steve call 239-985-7505 (direct line) or email Steve@OffshoreSailing.com.